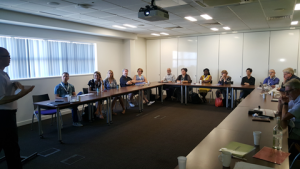 The International History of Public Relations is an annual conference that is organised by Bournemouth University and is in its ninth year running. Since 2008, the conference has evolved from what was a History of Public Relations special issue of the Journal of Communication Management to attracting a wider international audience and following showing the interest in public relations history. 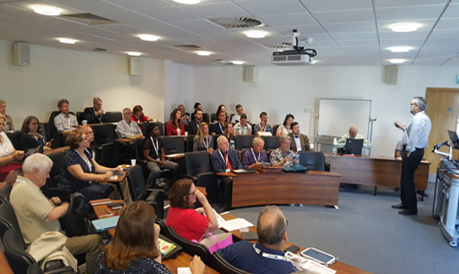 This year the conference was attended by over 50 delegates from various countries with 40 papers presented and discussed by single and group authors. During his speech he also referred to the importance of symbolism for the number 9 with the football semi-final link which had the audience in laughter, some in anticipation of what the World Cup final would bring! But as we all know now it did not come home! But it did in France!! The conference was run in two parallel streams which gave a tough choice on which to attend as they were such insightful discussions. From seeing the similarity in the journey of PR education in Iran presented by (Hossein Afkhami) and Libya (Mokhtar Elareshi (Mohamed Ali,Nasrin Ibrahim and Mohammed Ibraheem) to the history of PR education in Germany between 1950 and 2017 by Gunter Bentele. Dustin Supa discussed the historical typology of fake news and its impact on the history of public relations; fake news is old news followed by other scholars from the US with presentations highlighting the use of PR in public governance; William Anderson presented how the US Government used public relations to ensure public acceptance of a personal income tax while Abigail Cook, Jamil Hogeboom and Tom Isaacson gave insights on evolving public relations and the role of social good, tactical changes in historic and modern US campaigns. With academics and practitioners from Iran, Iraq, Spain, Australia, Canada, Germany, Spain, Britain, Libya, Norway, Sweden there was an array of topics that were discussed. Several papers highlighted various forms of teaching in PR and how it is evolving; Mike Watson presented on the relevancy of higher education PR degrees in a skilled migration global world, Alton Miller on the teaching of public opinion and PR practice, Kate Fitch and Jacquie L’Etang discussed a paper on problematising history in the PR curriculum. As a master’s student in Corporate Communication attending this conference and meeting these PR academics and practioners was very enlightening and am more aware of the journey of PR in different global contexts. The presentation of Rosanna Planer who discussed Boundary-Spanning in the course of time and the development of an integrative approach of PR and organisational communication resonated with my current studies and can be carried back into practice. This conference is always a great opportunity for academic researchers, historians and practitioners to meet, hear papers and discuss this expanding field of research, he added.